Delivery was 1 week later than the guaranteed delivery. Had to shop elsewhere. Item as described and well packaged! Took one week over the time expected to receive the item. They do not answer on time, They have lost my package and are not responsible. The item did not ship. Seller cancel w/o consent. Blames Fedex. I want my item! Seller decided to cancel order, citing unconfirmed address. Slow communication and refused to resend after failed fedex delivery. 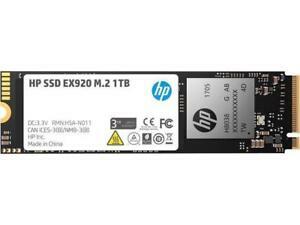 Great m.2 SSD that offers fast speed for little compromise. This is an m.2 nVme ssd. It's super fast and small. Works perfectly well for standard use and was easy to install on my computer. This drive either has bad firmware or temp sensor as it always reports 54C under idle and intense read/write sessions. The is a well documented problem that HP refuses to address (seriously, google the drive number and you'll see HP forums full of the identical issue). Sorry, HP. I'm going to Samsung (like I should have in the first place). Don't make my mistake, avoid even if the price is good. They won't stand behind their products. It's fast and so far, reliable. There is however, the matter of the temp Sensor. It's unclear if the sensor they used if defective, or if it's simply a firmware bug (I'm hoping it's the latter.) it seems that hp will not acknowledge this problem so it may never get fixed. It's not a big deal unless you plan to use this drive in a system or an environment with high temperatures. Great SSD, but HP borked the temperature sensor so this drive always reports 54 degrees celsius as it's SMART temperature readout... which is a fairly major design flaw, especially if you're going to be running this drive in a thermally challenged situation... such as a laptop. My Matebook X Pro is especially hot at all times and I haven't had issues with the drive yet but that being said, it's a risk you're taking with it. Otherwise for the money it's great. At the time of this review, I've only been using this for a week. It's actually slower than my previous 128 GB that was there. But I wanted a bigger SSD. I don't mind the slight trade-off as I get a lot more space. It's great for video editing!